2.0 Hindi 12th Day (2nd Monday) Box Office Collection, Solid! 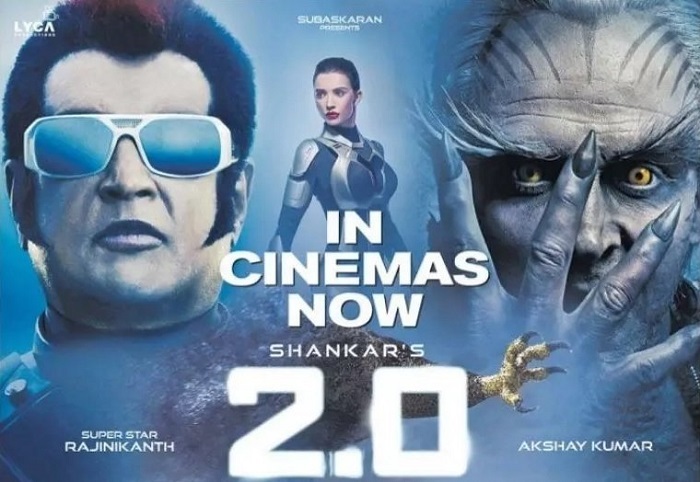 2.0 Hindi version has shown solid hold at box office on 2nd Monday (12th day). Film has registered a drop of around 35% from 2nd Friday. This drop is very much acceptable and now hope that film trends well through the weekdays. 2.0 has collected an approx 3.75 crore nett on day 12 as per estimates. Film total business stands at approx 170.5 crore nett. Film second week total is right now trending towards 40 crore nett mark. Film will go close to 180 crore nett or may even touch that by the end of this week. In the third week even with a decent trending 2.0 will cross 190 crore nett mark. Depending on the trending it may even touch 195 or even go close to 200. However, for the film to touch or go beyond 200 crore mark will need to stand its own against the like of 'Zero' which releases on 21st December, 2018. Total -> 170.5 crore nett (approx). Not that solid for a 550 cr. film. Agar budget se compare krna hai to all India collections compare kar . Definitely 200cr + in hindi. Verdicts are declared on the basis of theatrical rights.in Hindi its already hit n moving towards super hit.in andhra also it will be semi hit at least.Karnataka its already hit.in chennai it has crossed bahubali 2 but in other parts of tamilnadu its bit struggling.so don't compare verdicts based on budget. Verdicts are given on the basis of theatrical rights n not on the basis of budget.Hindi rights are 80 CR's so its clean hit in Hindi n moving towards super hit. In andhra n telangana,karnataka too its a success story.only in tamilnadu state its lagging but chennai city has crossed bahubali 2's lifetime collections already as tamilnadu trade analysts. But could you advise, talking only about all-India collection, because budget is 550cr approx, and all-India collection is no where near meeting the budget cost, will 2.0 be declared a theatrical flop? Whole Bollywood fraternity, media came forward to save this movie. This is not that good movie at all. Saving high budgeted movies is also the responsibilities of stakeholders otherwise the industry could be in danger at the end of the day.